I’m thinking back to yesterday and the conjunction of two different feasts, Corpus Christi and the Feast of the Visitation. It’s worth commenting on why two different sites—like the St. Bede’s Breviary and Daily Prayer—would choose one over the other. How do we think through these decisions theologically and what are the practical logics involved in these kind of kalendar calculations? First off, this kind of thing happens not infrequently. That is, two days of significance to the church will overlap with one another because we have two different ways of reckoning dates for liturgical occasions. One is a Temporal cycle that shifts with the seasons, goes by weeks, and is calculated by means of Sundays which do not maintain a consistent date on the calendar every year. (Hence the tables on pp. 880-885 of your ’79 BCP.) The other is the cycle of fixed Holy Days. These are a combination of days celebrating apostolic saints (like Peter, Paul, Mary Magdalene, etc.) and feasts of Our Lord either directly (like Feast of the Holy Name) or indirectly through events surrounding the Incarnation (like The Visitation, the Nativity of Saint John the Baptist, etc.). These are, clearly, fixed on certain calendar dates. There are a few different approaches to deal with occurrence. The first is to let one event supplant the other entirely. This is the simplest route. The second is transference. This is where one feast stays on its original day and the other gets bumped to the next open day. The third is commemoration. This is where both feasts stay on the day, one gets the spotlight and the other gets an honorable mention. The prayer book’s preferred option is the second, transference, and the mechanics of this process is discussed on pages 15-17 of your ’79 BCP. But—choosing one of the three options only determines your course of action, it doesn’t solve the problem of precedence: which feast stays and which goes (or gets the spotlight). figure these things out—and these exist in spades! Here’s the problem with the traditional systems. Most of them begin with facts on the medieval ground and proceed by attempting to figure out logical rules that can be universally applied. Thus you have something like a calendar from a Book of Hours written around 1485 in Bruges following the Roman Use (Walters W.. September has three days written in red: September 1st for the Abbot Egidius, the Nativity of the BVM on the 8th, and the Exaltation of the Cross on the 14th. (And note the feast of Philip and James in black on the 13th!) What happens if a Sunday falls on one of these days? There’s no clear sense in this manuscript of how one would work it out or exactly what “red” means. Now—to be perfectly fair, that’s from a Book of Hours. 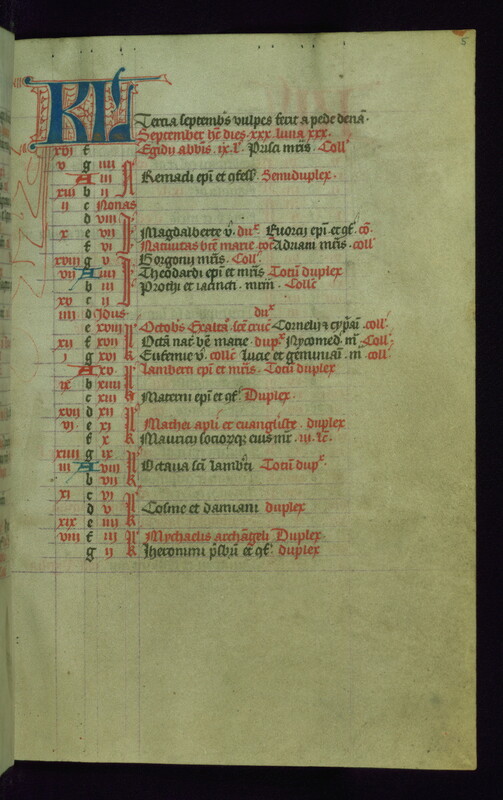 The function of a kalendar in Books of Hours was more general familiarity with where we are in the year and which saints are being celebrated than anything else. While you might use a certain collect or set of devotions based on the saint of the day, the prayer offices did not change. As a result if we really want to know what an actual medieval system for reckoning the Office looked like in the flesh we need to look at something like this kalendar from a breviary written around 1420 according to the Use of Liege (Walters W.83). If you look carefully here there are directions in red regarding what to do and how these various feasts ought to impact the Offices. Hence, in this use, the feast of Abbot Egidius is a feast of nine lessons (.ix.l.) meaning longer than normal. The feast of the holy virgin Magdalbert on the 7th is a “double” of a certain sort (dux) and is the primary feast of the day—the feast of Bishop Evortius is only commemorated with a collect (co[ll]). On the next day, the Nativity of the BVM is a double with all of the antiphons doubled (tot) with a collect commemorating the martyr Adrian (coll). The point I’m making is that books like these recorded what communities did and largely they had their own ideas about how things ought to be done. Systems grew up that attempted to systematize and regularize around these practices and that can lead to a confusing welter of gradations formalized at the Council of Trent and beyond that divides feasts in Greater Doubles of the First or Second Class as opposed to “normal” Greater Doubles or Lesser Doubles (leaving aside semidoubles and such entirely…). These were the kinds of complexities that the Reformers pushed back against. Classically, Cranmer complained about these in the preface to the first Book of Common Prayer: “Moreover, the number and hardness of the Rules called the Pie, and the manifold changings of the service, was the cause, that to turn the Book only, was so hard and intricate a matter, that many times, there was more business to find out what should be read, than to read it when it was found out” (BCP, p. 866). Honestly, the Sarum Pie isn’t that hard to follow, but you get his general gist. In the run up to Vatican II, the Roman Catholic Church simplified their kalendar systems quite a bit. When we decided to adopt an expanded kalendar in the ’79 BCP we more or less modeled ours based on the Roman Catholic concepts produced in 1963 and 1964 that yielded a papal motu proprio on the kalendar in 1969. And, as I’ve said before, when trying to understand many aspects of the ’79 BCP we should look first to the liturgical reforms of Vatican II first (Point 4 at this link). What the Calendar section of the BCP tries to do is to express something very much like the list from section 59 of Paul VI’s motu proprio Mysterii paschalis. What I don’t get is why they didn’t just put in the list (or a list)! * The starred categories reflect the freedoms given in the Days of Optional Observance section. Practically speaking, the Prayer Book allows the appointment of propers to any day that does not contravene the pre-existing rules. This allows feasts already in the Calendar to receive additional celebration or the addition of other feasts so long as the other rules are obeyed. So—now we get down to brass tacks… The Visitation is listed on page 16 of the BCP as a Holy Day and a Feast of Our Lord. That gives it a pretty high ranking, a 10 on my scale. Corpus Christi doesn’t actually appear in the BCP. For some folks, that’s the end of the discussion right there. The Visitation is in the book, Corpus Christi isn’t, Visitation wins. But, Corpus Christi is of long-standing importance in certain communities in the church. For those communities, this remains a live issue. Looking back at older rules (that many of these communities base their reckonings on), Corpus Christi was considered a Primary Double of the First Class; the Visitation was a Primary Double of the Second Class. Under those rules, Corpus Christi wins. But what about our current rules? The way I reckoned it for the St. Bede’s Breviary was to view Corpus Christi as a Feast of Our Lord (10). The Visitation is also a 10—so which 10 is more 10 than the other? This is where we apply the rule of dignity of persons. Which more directly displays to us who Jesus is and is for us in our experience? Based on my answer to this question, I argue that Corpus is more directly a Feast of Our Lord than the Visitation. That’s not to say the Visitation isn’t important at all. It’s just to say that in this particular match-up, the revelation of Christ in the Eucharist ranks ahead of the Visitation. It’s a judgement call. And, again, I don’t disagree with those who point out that Corpus Christi isn’t in our BCP. But, if nothing else, this gives us an opportunity to think about the directives and principles by which we give spiritual expression to the incarnate collisions of our faith. This entry was posted in Church Year, Daily Office on June 1, 2018 by Derek A. Olsen. Of course, Rome has solved this problem by moving Corpus Christi to this coming Sunday. This means, for me, that I will read the Offices of Corpus Christi From First through Second Vespers (Benedictine Breviary). Mass will be either of C.C. or the Proper Sunday depending where I show up or say Mass. Not the best solution, but works for me. Probably I should have opted for the transfer solution but that leaves some of the Faithful without the celebration they were expecting on the 31st. And just how many angels are on the pin head? ?